Introduction: Although high recurrence rate after curative treatment is a major issue in the treatment of hepatocellular carcinoma (HCC), repeated intervention for recurrence is reportedly correlated with better survival outcomes. This study sought to investigate the clinical impact of repeated intervention for recurrent HCC and establish a new surrogate measure for survival, the time-to-interventional failure (TIF). Methods: Through a retrospective review of all consecutive patients who underwent curative resection of HCC between 1995 and 2017 (n=1175), predictive powers of recurrence-free survival (RFS) and TIF, which defined as a time elapsed from resection to unresectable/unablatable recurrence, for overall survival (OS) were compared. Then, prognostic impact of repeated treatment for resectable/ablatable recurrence was evaluated. 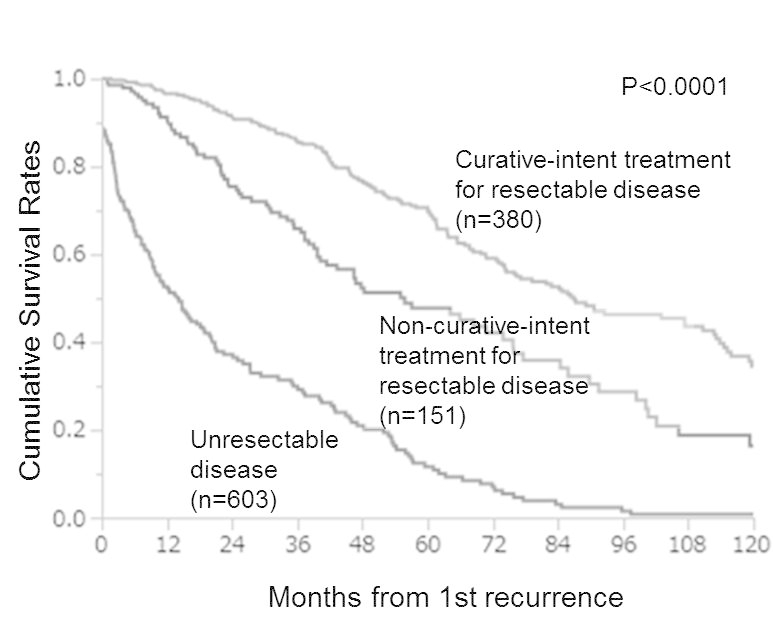 Results: With a median follow-up period of 83.5 months, 691 (58.8%) recurrence events were observed and 78.4% of them were resectable/ablatable recurrences. Of these, 98.7% of the patients underwent repeated treatment. In evaluation of predictive powers for OS period, TIF showed stronger correlation than RFS (r=0.89 vs. r=0.65). Correlation between OS and TIF was much stronger when focusing on the population presenting with resectable/ablatable recurrences at the 1st recurrence events (r=0.95, p<0.0001). Patients who underwent curative-intent treatment (i.e., resection or ablation) for recurrence showed significantly better survival outcomes compared with those who underwent non-curative treatment (e.g., TACE, chemotherapy, etc.) or those who presented unresectable/unablatable recurrence (median OS, 86.9 months vs. 55.7 months vs. 14.1 months; p<0.0001) (Figure). This tendency was constant across the AJCC tumor stages. Conclusions: OS after resection of HCC is highly dependent on TIF than RFS. Aggressive curative-intent intervention for recurrence may prolong survival outcomes regardless of the cancer stages of HCC.